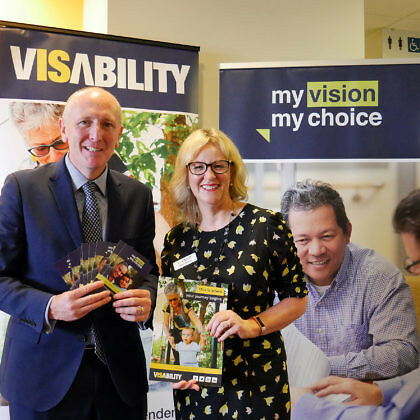 Western Australian based disability service provider VisAbility has officially launched My Vision My Choice, a new online resource to assist people with vision impairment to navigate the National Disability Insurance Scheme (NDIS). The website was officially launched by the Honourable Stephen Dawson MLC, Minister for Disability Services, at VisAbility’s Perron Centre in Victoria Park on Friday 16 November. “Congratulations to VisAbility for its ongoing commitment to Western Australians who are blind or vision impaired,” Minster Dawson said. “The website will have a major impact in rural and remote WA where access to information and education can be limited – especially important with VisAbility now providing NDIS services in the Kimberley and Pilbara,” said Minister Dawson. The National Disability Insurance Scheme (NDIS) is a significant change that affects all people with disability. Every person with disability has different goals and needs, and as such each person’s experience of the NDIS will be different. Kenneth Phua is an NDIS participant and is legally blind. Kenneth admits the NDIS was a significant transition, and, in the early stages, he struggled to find information that was relevant to his circumstances. Information in the My Vision, My Choice portal is specifically written for people who are blind or have low vision, their carers and families. It focuses on the most relevant supports, including communication, transport, access to information, therapy, and recreation and leisure, and presents information in a way that is easy to access and easy to understand. The portal also gives planners and disability service providers resources to achieve the best outcomes for people with vision impairment. While My Vision My Choice is specifically designed for people with vision impairment, it is written in easy English so that it is also accessible to people with print disability, people with acquired brain injury, as well as people from Aboriginal and culturally and linguistically diverse (CALD) backgrounds. “The NDIS has opened up a world of opportunity for people with disability. Never before has there been so much choice: for care, services or providers. Control now sits firmly in the hand of each individual, as it should,” said Dr Clare Allen, Chief Executive Officer at VisAbility. “At VisAbility we are helping to shape a world where people with disability have the same right to participate, same range of options, same level of freedom and same control over their day to day life and decisions as any other person. My Vision My Choice brings our sector one step closer to making this vision a reality,” Dr Allen said. My Vision My Choice was developed through generous grant funding from the WA Department of Communities. The My Vision My Choice website is available at www.myvisionmychoice.org.au.